If I got low to the ground and looked down to portray the southern dewberry flower you saw last time, I’d lain on the ground a few minutes earlier on February 22nd and aimed upward enough to align these cattails (Typha latifolia) with the cumulus clouds overhead while excluding the power lines and buildings adjacent to the Arbor Walk Pond that hosted these plants. The central cattail reminded me of Auckland’s Sky Tower, which I visited in February of 2015. 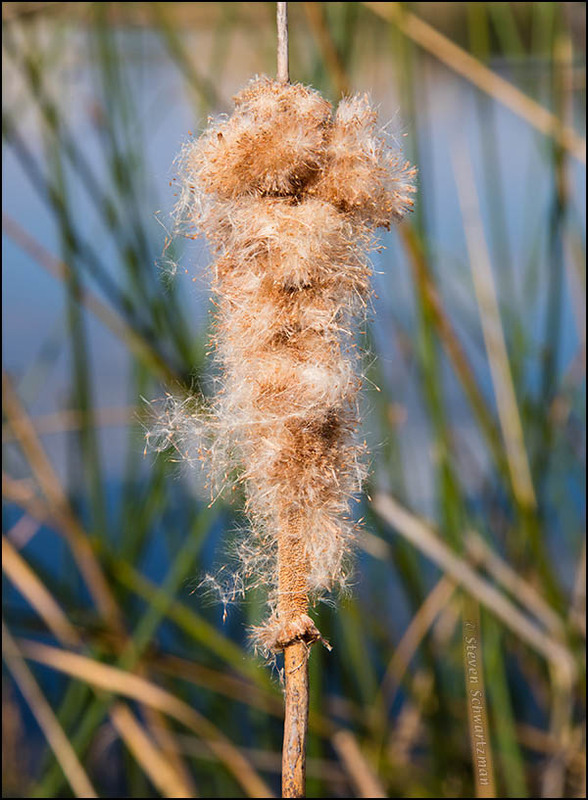 Below is a closer look at one of the unraveling cattails. This time I was standing and aimed slightly downward to bring in the pond but keep out the buildings on its far side. All those segments beyond the cattail were bulrushes. Steven: This is a special image. Kind of reminds me of me. Unraveling sooner than later these days. I’m sorry you associate the unraveling with yourself, but I can relate to the sentiment. Our views of life rely on our perspectives. They can be changed. That raises the philosophical question of whether there’s a reality apart from one’s perceptions and perspectives, and if so how much. Better make it a grande and take tiny sips. Too late. I made a half cup and it’s gone. I vote for there being reality without me. I have no philosophical argument to support that position. The world/universe will go on without me as it has before me. It doesn’t care. What does matter to me is whether I leave my ‘home’ better for being here. That’s a laudable goal in your fourth observation. What you said in the third may well be true, yet I think many people throughout history have been saddened by the thought and have hoped (or believed) that there’s more. Yes. People need hope for something better. The Sky Tower! That was the first thing that came to my mind, before I actually read your description. I take it you’ve been to the Sky Tower. If so, the fact that we both thought of it isn’t such a coincidence after all. Oh! No, no. I have not been there. But I have seen it many times in pictures. You’re more aware than I was. I don’t recall knowing about the Sky Tower before I started doing research in preparation for my trip to New Zealand. I hope you get to see it in person someday. I’m thinking that your title could have been “The Advantage of a Good Vantage Point.” Everyone sees the cattail from a vantage point, but not every vantage point helps to reveal the beauty of the plant, or its relationship to the world, or its essential characteristics. In any event, this is a great pair of images. The first reminds me of those old metal desk spikes. 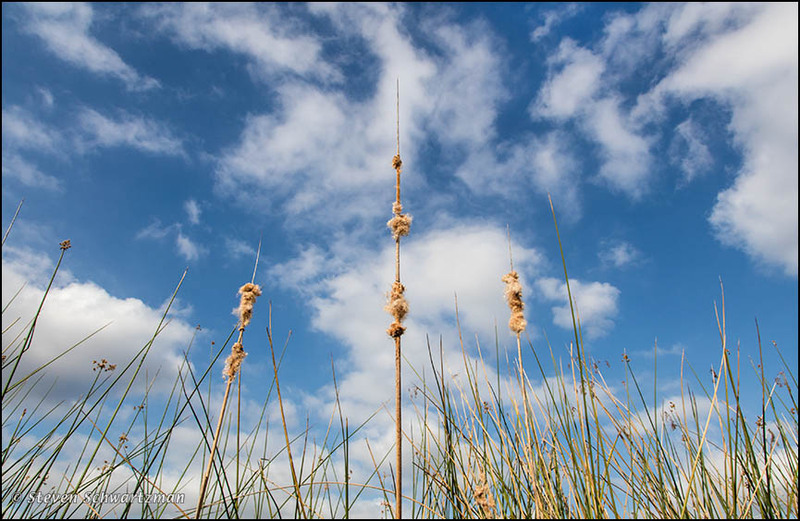 Instead of paper, your cattail could hold clouds. As a photographer I always look for a vantage point that will enhance my subject. Given that I work so much in Austin, that often means hunting for a way to exclude human things like buildings and wires. As you’ve heard so many times, lying on the ground and aiming upward often does the trick. 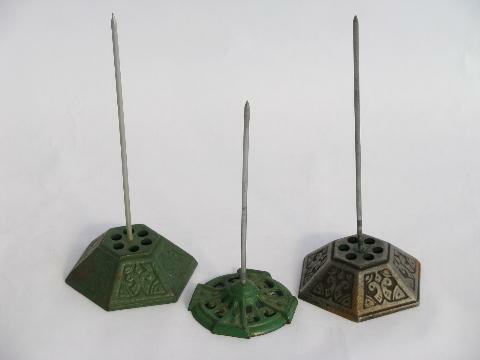 I wonder how often office workers got stuck by or even impaled by those old metal desk spikes. Thank you for this image Steven and thank you to all those who commented. It offers food for thought what others write, perhaps next time I walk where unravelling plants grow I will go more carefully and think about their aging beauty better. You’re welcome, Lindylou. I agree that people’s comments are an important part of this blog and I learn a lot from them. As for decomposing seed heads, I’ve been fascinated with them for a long time; they’ve provided many a picture over the years. Lovely images! I haven’t tried lying on the ground yet, but I do kneel quite a lot. Yesterday I knelt down to take a picture forgetting it had been snowing, which meant wet jeans from the knee down for the rest of my walk. Kneeling can often be good enough for an effective portrait, but sometimes only getting all the way down on the ground does the trick. Both kneeling and lying down make us more vulnerable to inhospitable things on the ground, so I always carry a mat with me for at least some protection. If I anticipate walking on wet or muddy ground, or if I expect to walk in a creek, I put on a pair of hip-high rubber boots (which I keep in the trunk of my car). I’ve been fascinated for years with the way these seed heads unravel and have often photographed the phenomenon. You have a species in New Zealand known natively as raupō but I don’t remember seeing it during my visit last year. Once again, whether going or coming, up or down, straight on or sidewards, it’s all about perspective and how one’s eye perceives the phenomenon of composition. In both cases here, you controlled your environment in a desirable way for pleasing photographs. Your comment made me imagine singing “Yes, I’m the great controller…” Perhaps my pretend audience sang back with “Please please me.” At least that’s my perspective on this. Nothing pretend about the images. Thanks. The Platters sang “Too real is this feeling of make believe,” but I’ll agree with your that these images aren’t make believe.